This product gently supports your palm, providing a stationary palm rest and mousing surface. The LaunchPad can be used on a cluttered desk, in your bed, on your lap almost anywhere. SureTrak Mouse Pad Surface is optimized for accurate mouse control and prevents the clogging of mouse mechanisms. Superior to fabric and Lexan pads. 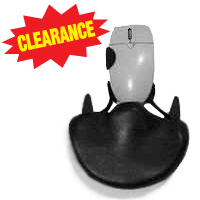 The patented palm rest mouse pad enables quick intuitive fingertip control of your mouse, trackball or touchpad.